The Rev. Walter Fauntroy (L) speaks, while the Rev. Al Sharpton (R), listens during a news conference in front of the John A. Wilson Building on Aug. 27, 2010 in Washington, DC. The elderly former D.C. congressman arrested this summer on charges he passed a bad check for $50,000 had the charges dismissed Monday after he submitted a payment, officials say. Charges against Walter Fauntroy, 83, were dismissed by the Prince George's County State's Attorney's Office after he paid $20,000, the office said. The court required that he pay $19,800. "It has always been the intent of the Congressman to pay this debt, and he had already paid a substantial amount before he returned," Fauntroy's lawyer, Johnny Barnes, said in a statement. "This matter is now behind him, and he is overjoyed that he can move on and concentrate on his life's work." Fauntroy was accused of fraud, writing a bad check in Prince George's County and failing to appear in court. 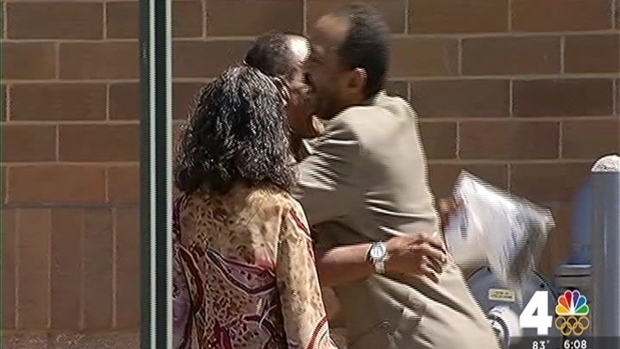 News 4's Tom Sherwood talks to family friends who were outside the Loudoun County Detention Center Tuesday when Walter Fauntroy was released from custody. The reverend and former D.C. congressman was arrested Monday on an outstanding warrant following his return from the Middle East. The former right-hand man to Dr. Martin Luther King Jr. was detained at Washington Dulles International Airport in June after he returned to the D.C. area following nearly five years living in the Middle East and Africa. Fauntroy told The Washington Post before his return that he believed the bad-check issue had been resolved. Loved ones had expressed concerns about his health and had believed he was missing. Fauntroy helped plan the 1963 March on Washington and served for 20 years as Washington's first elected delegate to Congress. He told the Associated Press last month that he plans to resume his travels. His wife said she is not letting him go anywhere, the AP reported.